Postage UK - £2.70 Europe - £5.15 Rest of the world - £7.55 *Please select the correct delivery area to avoid delaying your order. This unique and brilliant book explores the physical basis of learning difficulties, Dyslexia, Dyspraxia, Attention Deficit Disorder (ADD) and Attention Deficit Hyperactive Disorder (ADHD) with particular focus on the role of abnormal reflexes and the effect upon subsequent development. 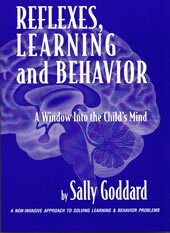 Sally Goddard, Director of The Institute for Neuro-Physiological Psychology, Chester, explains how the reflexes of infancy (primitive and postural) can affect the learning ability of the child if they not inhibited and integrated by the developing brain in the first three years of life. Each reflex is described together with its function in normal development, and its impact upon learning and behaviour if it remains active beyond the normal period. Simple tests for the reflexes that are crucial to education are described, together with suggestions for suitable remedial intervention. A brief history of how current methods of intervention designed to correct abnormal reflexes have evolved is included and a summary of some of the relevant research in the field.